The OK-395AK Laminating machine has been developed by Practix Manufacturing with the specific purpose of providing lamination of thick foams up to 5-inches thick. 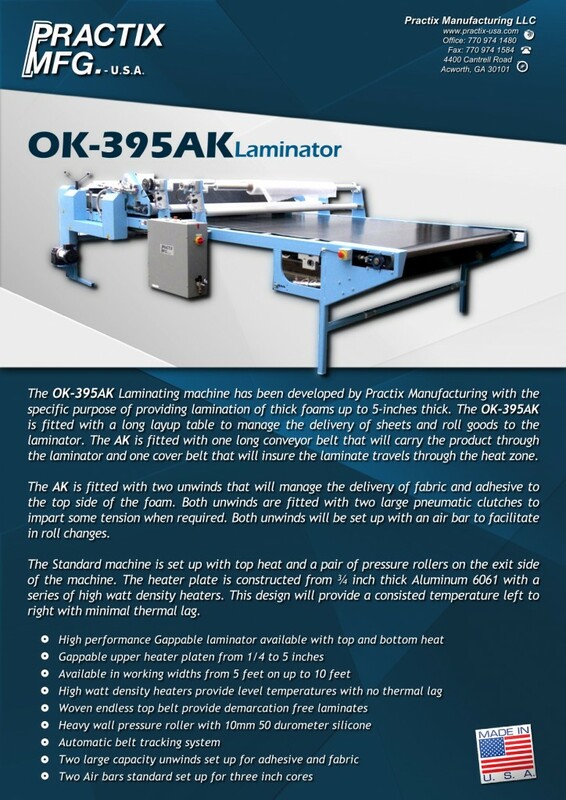 The OK-395AK is fitted with a long layup table to manage the delivery of sheets and roll goods to the laminator. The AK is fitted with one long conveyor belt that will carry the product through the laminator and one cover belt that will insure the laminate travels through the heat zone. The AK is fitted with two unwinds that will manage the delivery of fabric and adhesive to the top side of the foam. Both unwinds are fitted with two large pneumatic clutches to imparts some tension when required. Both unwinds will be set up with an air bar to facilitate in roll changes. The Standard machine is set up with top heat and a pair of pressure rollers on the exit side of the machine. The heater plate is constructed from ¾ inch thick Aluminum 6061 with a series of high watt density heaters. This design will provide a consisted temperature left to right with minimal thermal lag. Each Practix fusing press is beautifully handcrafted and quality built to last, with attention to engineering detail until now unavailable in its price range. Our sublimation equipment is fully customizable to your desired size and color. All of our heat transfer machinery comes backed with a one-year mechanical warranty and a six-month electrical warranty. In addition, we offer next day and worldwide shipping, so whether you make hats in Baltimore or t-shirts in Hong Kong, we can supply you with the top-quality embossing machines in the industry.